Keep an eye on the children while having them in a contained space. Our play yards can easily be assembled anywhere. The pool area, living room, or at the beach. Put a canopy over the play yard for shade and comfort. Bring some beach toys and your kids will be set for the day. 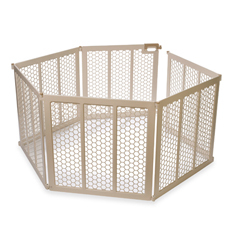 Our portable play yard can easily be moved anywhere using the carrying straps. Even if you are just using it in your rental the play yard is easy to move. Don’t forget your highchairs, cribs, and strollers. We also offer free delivery of all your beach and baby items.